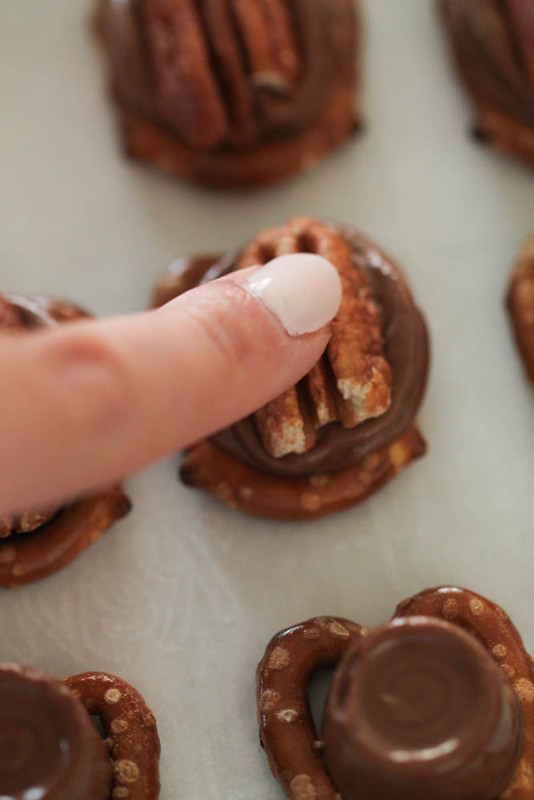 These Rolo Pretzel Turtle Bites are the BEST holiday treat. If you are looking for a fast and delicious Christmas treat or candy to make, then you need to try these. They are the perfect combination of sweet and salty, and you won't be able to have just one. 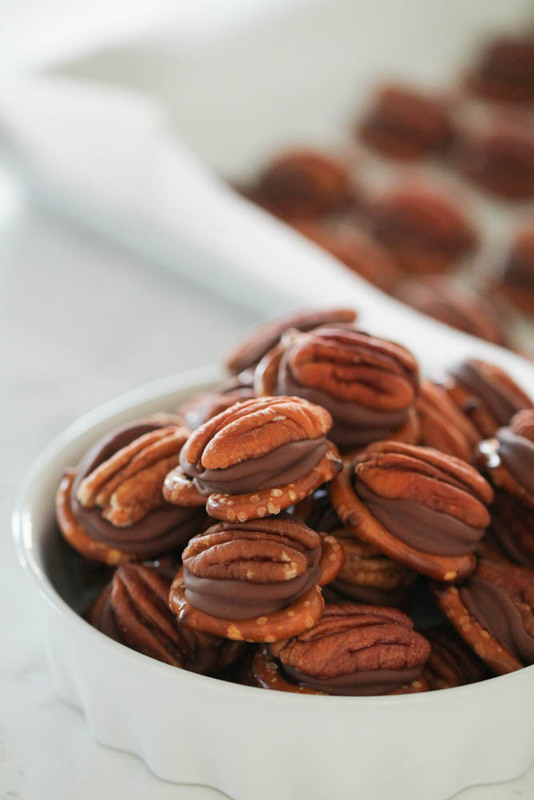 These Rolo Pretzel Turtle Bites are a staple at our house every Christmas. My mom has been making these for years (as I am sure many of you have, too) and I always eat way too many of them. Something about the sweet and salty that gets me every time. They are so simple to make, require very little time, and make a great gift for neighbors. If you are looking for a quick and delicious holiday treat, you just found it. 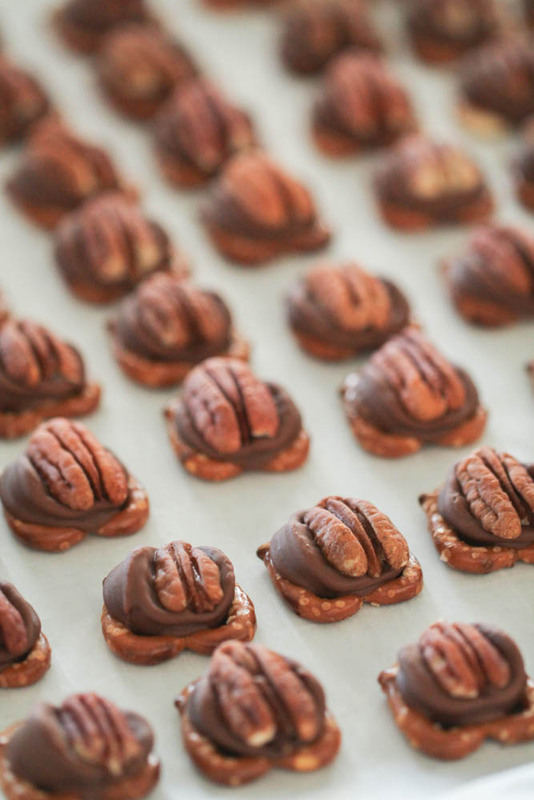 These Rolo Pretzel Turtle Bites take just minutes to throw together, and taste absolutely amazing. You will love them. Start by lining a baking sheet with foil or parchment paper while your oven preheats to 350 degrees F.
Cover your prepared baking sheet with pretzels. 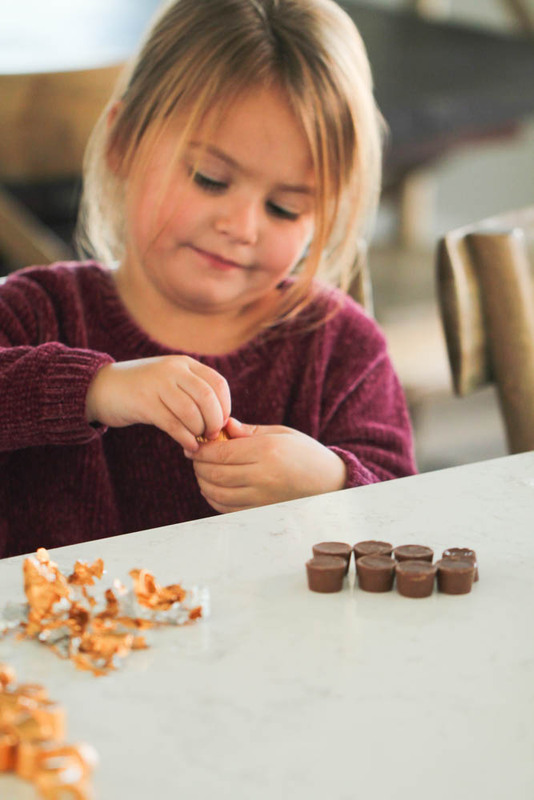 I recruited the help of my cute 4-year-old to unwrap the Rolos! 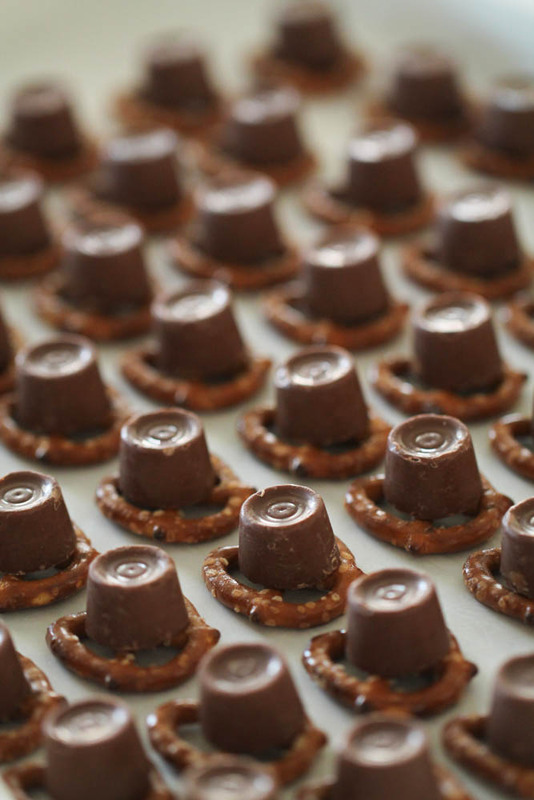 Place a Rolo in the center of each pretzel then bake for 3-4 minutes until the Rolos are soft. Remove from the oven and gently press a pecan half into each Rolo. Let them cool until the Rolos firm up again. I usually place the whole pan in the fridge to help speed up the process. what other things could I use as toppings? 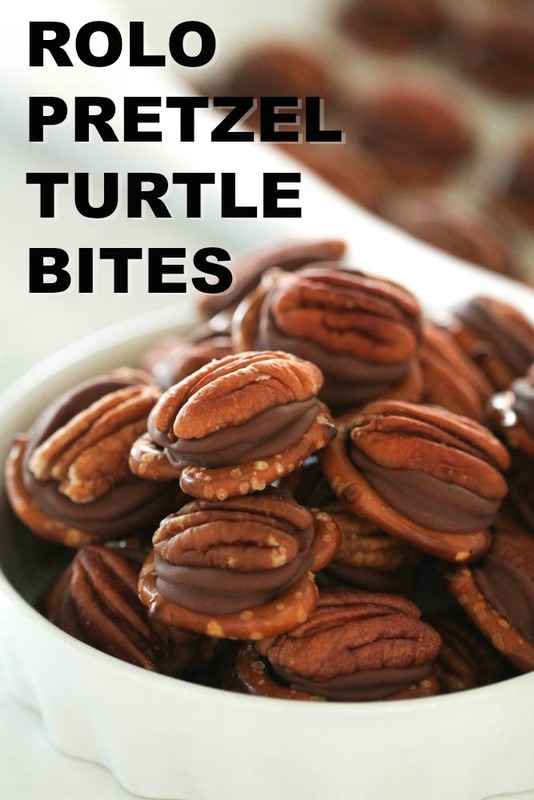 If you don’t love pecans you could add any of your other favorite sweet treats. You could add seriously, any topping to this treat and totally make it your own. how long are these good for? Well, if you don’t eat them all within the first day of making them, be sure to keep them in an airtight container. They will last for about 6 days in an airtight container, before the pretzel starts to go soft, and the caramel becomes really hard. If this is a treat you need to make a few days in advance, we recommend just leaving them in an airtight container and not freezing or refrigerating them. Freezing them will make the caramel hard and as it thaws, it may soften the pretzel. We recommend leaving them out on the counter in an airtight container, for the best taste and texture. I love variety. I love nibbling and tasting all kinds of holiday treats. Luckily we have a few other simple homemade candy making recipes, that would pair perfectly with this one. My mom usually makes us a little plate of candy every year. On each one there is one of our Homemade Microwave Caramels. They are so soft, and creamy, you would have no idea that they were microwaved. You HAVE to try them. She also adds a few Peppermint Oreo Truffles. These are my all time favorite, and they only have 4 ingredients. They are so soft and creamy. Also very rich. Our 4 Ingredient Rocky Road Fudge is also an easy-to-make, holiday treat your friends and loved ones will go crazy for! 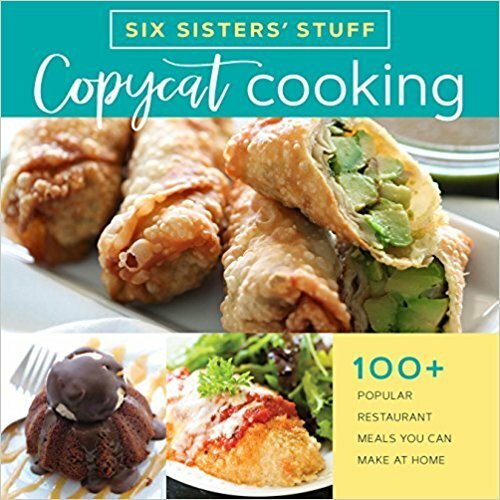 Our newest cookbook makes a great holiday gift! A simple treat that is perfect for a holiday party or neighbor gift plate! 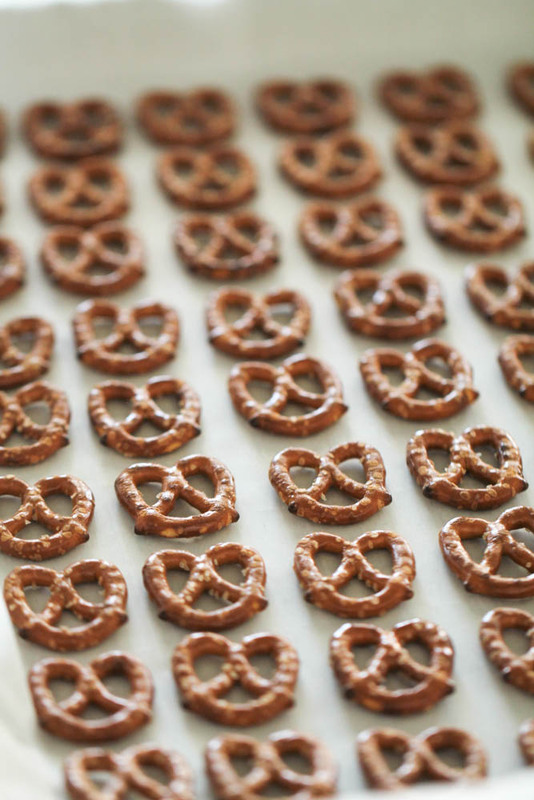 Evenly space pretzels on a baking sheet lined with parchment paper or foil. Place a Rolo on top of each pretzel. Bake for 3-4 minutes, just until Rolos are soft. Remove from oven and gently press a pecan into each Rolo. Let cool until Rolos set up. You can place them in the fridge if you are short on time. Our Peanut Butter Snowballs are the perfect holiday treat and they are so easy to make! This is perfect! I was looking for a quick and simple sweet treat to make for holiday gifts for the office. I make this and hand them out before taking off for winter break! These are one of my favorite holiday treats too! I haven't made them yet this year but plan to! Love these! So simple yet SO good! I just made these and they are so easy and taste AMAZING! They are the perfect combination of sweet and salty. I can't wait to take them to my social tomorrow night. You may also be able to use Sixlets if you can find those in your area....they may not have a nut warning.